Microsoft had quite a showing, lots of games, some exclusives, a MASSIVE Halo collection, and a huge lack of Kinect (which was for the better). There could have been a few more surprises but over all, it was one of Microsoft’s press events in recent memory. Games was the theme of the event, no mention of Kinect, NFL apps, TV, and the celebrities were turned down to minimum. Let gets to the games and like the press event I will break them up into things you will be playing this year and things you will be playing net year and in the future. Here we go! Call of Duty: Advanced Warfare – 11/4/2014 – There was a live gamplay demo given like there is every year. While it looking very nice, it did not pull the a wow factor. The game still looks incredibly scripted, it did not appear to have the signature 60 FPS (though it could have just been the stream), and it looked bland. Everything just looked like gaming Sci-Fi tropes. Microsoft, as always, will have the DLC first on the Xbox One. Forza Horizon 2 – 9/30/2014 – This is where the press event picked up and never let go. I loved the first Horizon and I am stoked it garnered enough for a sequel. The drivatars from Forza 5 will be transferable to Horizon 2, there will 200+ cars, and you can create clubs with up to 1,000 other players. The game will be 1080p, but 30 FPS like the previous Horizon title. Evolve – The new title from Turtle Rock studios is looking like a blast and the Xbox One version is getting exclusive content and beta. Assassin’s Creed Unity – Ubisoft’s venerable franchise is back in 18th century France during the height of the French Revolution. There will be a new lead character and the edition of 4-player co-op. Dragon Age 3: Inquisition – 10/07/2014 – The game is looking beautiful running on Frostbite 3 and the Xbox One has snagged content first. Sunset Overdrive – 10/28/2014 – The Insomniac developed exclusive looks like a massive load of fun. A third person shooter, with an emphasis on traversing the terrain in fun ways, the game will have a solo mode as well as a 8 player co-op mode. The game will have day one edition. Dance Central Spotlight – There will be a new Dance Central game, it will be download only, and was the only hint at Kinect during the event. Project Spark – the create a game, game has hit 1 million creations. There will be Conker (Conker’s Bad Fur Day) content coming to Project Spark soon. Ori and the Blind Forest – a new game from Moon Studios that looks incredibly beautiful and touching. Halo: The Master Chief Saga – 11/11/2014 – This game garnered a huge applause from the crowd at the event and with good reason. For $59.99 you get Halo 1, Halo 2, Halo 3, and Halo 4; all four titles on their original engines but running at 60 FPS and at 1080p. The games will feel the way they did when they were released, all the nuances, fun, and secrets will be there. All 4 games will have their respective multiplayer as well, over 100 maps will be available. The collection will also debut the Ridley Scott produced series, Halo Nightfall, which ties into the upcoming Halo 5: Guardians. But that is not all, Halo 5: Guardians will have a beta this fall as well. Here comes the games you will be playing next year and beyond. Playdead Studios project – A new title from the Limbo creators was shown off and will be exclusive to the Xbox One. Rise of the Tomb Raider – A sequel to the excellent Crystal Dynamics reboot. Only a promotional video was shown. The Witcher 3: Wild Hunt – new gameplay was shown off. The combat still looks deep and complicated (that being a good thing). Phantom Dust – An original Xbox title is getting the reboot treatment just like Killer Instinct. The Division – Showed us a bit more gameplay, Xbox One will snag new content first. Scalebound – A new game coming from Platinum Games being published by Microsoft. 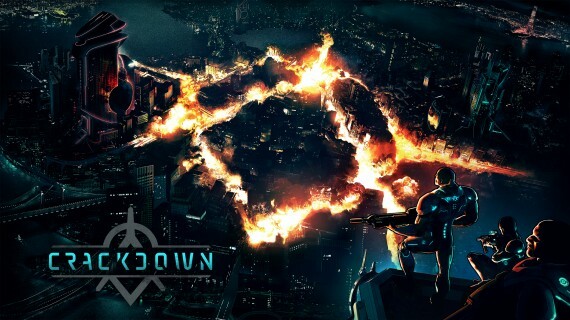 Crackdown – the venerable franchise is coming back, with series creator David Jones heading up the project.